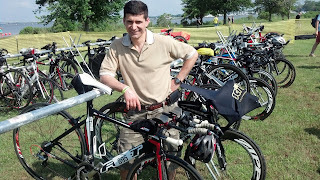 Eagleman 2013 was my first Half Ironman race and it was a "B" race for me - I wanted to try it out and see what it is like to race this distance. 70.3 distance is Half Ironman distance and includes 1.2 miles swim (1.93 km), 56 miles bike (90.1 km) and 13.1 miles run (21.1 km). On June 9, 2013 I finished the race with the time of 5:20:32. Total number of people participated in this race was about 2200 and they came from 48 states and from 20 countries, including USA, Russia, Canada, Mexico, France, UK, Netherlands, Brazil, Ukraine, New Zealand, Belgium and few other countries. Looking at the data above you can see that my swim is lagging - 58% means slower than average swimmer in this race. The race was wet suite legal this year and I did wear mine. At the start line of the swim (see virtual line between two buoys) I started on the very right hand side - out of the main crowd. I did not go hard at the swim - kept moderate pace thru the whole thing and did sighting every ten or so strokes. Did not get hit hard by anyone, but there were many times I got touched or pushed by those who was passing me. I did pass few folks myself (yay!). Water was not clear and you could not see anything just few inches deep into the water. The last leg of the swim went parallel to the shore line and it was shallow - you could easily stand on the soil and be shoulder deep in the water. You can see some folks are in fact standing or walking on this last leg of the swim. Work a bit harder during the swim in the race. I took this swim a little too easy. Transition worked quite well, but it was very muddy because it rained hard two days before the race. The run from T1 to the bike mount was almost like a swamp. Perhaps I should have carried my bike in the air, instead of rolling it on that mud. I did keep my bike shoes on the pedals and ran bare feet and then mounted on the bike at the exit. This was easy to do and worked well - it always does. The bike course was almost totally flat. Pavement was pretty good most of the time and in some places it was excellent new asphalt. Traffic was on the road, but police kept control of the traffic and every intersection and they did a great job at that. 56 miles was one big loop out and back from transition area. Aid stations were setup very well and nicely equipped with water and Gatorade. You throw your bottle away and they give you a new bottle of either water or Gatorade Perform. I carried two bottles with me on the bike, but could have carried only one to save weight since I knew this was a well managed race. In a not so well managed one will need two or three bottles on the bike. I went with moderate pace since I did not want to go all out and not be prepared for the run part. Initially passed a lot of older age groupers, but later those 30-40 folks passed me. Some with very high speed (I almost wondered if those were pros doing second lap :-). Overall I felt very good on the bike for the first 2 hours and the last half an hour got progressively harder and I feel like I probably dropped some speed. T2 worked well as well. I decided to put my socks on and it took some time. It was very muddy and I am glad I had a towel in my T2 to wipe mud off my feet. I am glad I did not forget to bring a race belt this time. Run is always the hardest part of the triathlon, but this one (despite being totally flat and not very hot - about 75 F) - this was very very hard for me. I felt like my run totally failed in this race as I expected to run at least my marathon pace (7:45 min/mile) - considering this was half-marathon distance, I was hoping I could maintain such pace, but due to an injury 7 weeks ago I dropped run volume and intensity and suffered badly on the run in the race - not being able to go faster. The good news is that my foot did not cause any troubles and at least I ran pain free. Hopefully I gain back my speed for the September Rev3 race.I literally ran like at no time before - from one aid station to the other and walked every one of them (ouch!). Back in 2011 during the marathon I did not walk once. This race was very different. I felt like somebody pulled be back and did not let me run well. It was hard to move legs. Did I go too hard on the bike? Not sure. I do not think nutrition was a problem either. I just felt like I was finishing marathon from the first mile of the run. I ran with slow pace more or less fine (it was hard, but not too bad), but had absolutely no strengths to increase the pace. It finally got harder in the last 4 miles where I walked three times - about 50 yards each time (on top of walking aid stations). I consider this run to be a total fail and most likely cause is the lack of volume and intensity in the last 7 weeks before the race. Need to increase run volume and intensity in preparation for the next Half Ironman race. I am thinking to adopt marathon training schedule from Hal Higdon (have not decided which one to take, but I want to keep it to 3 times per week - perhaps 4 times). 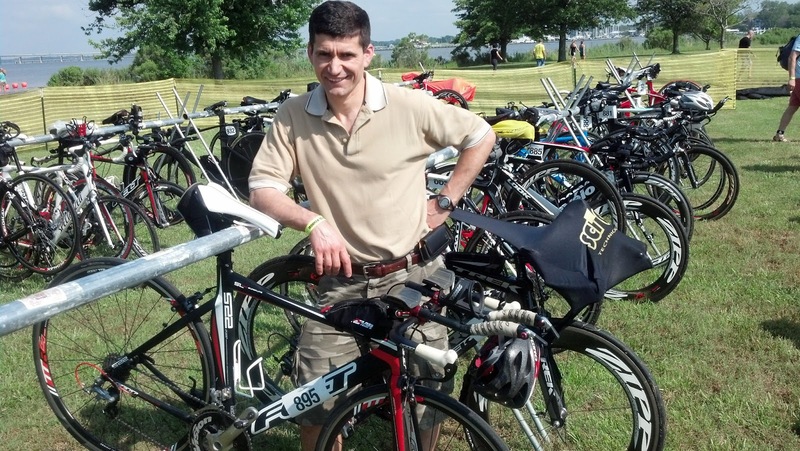 This race was in Cambridge, MD and I drove 6 hours from Pittsburgh with a friend of mine (his name is Roman too :-). He took every one of these pictures. I just realized that I do not have one picture of Roman from this trip - he was behind the camera all the time :-(. We camped next to the high school and there were about 50 other tents setup there. The weather was nice and everything would have been perfect, except for the fact that I simply could not sleep all friggin night. Damn nerves. Some folks say meditation may help - will need to try it next time. Not having sleep all night does not help. I felt well rested on the morning of the race, but I suspect it could have been even better if I slept. 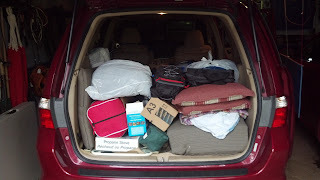 I got off bed at 4am and started packing tent, ate, went to the restroom three times (on top of two gazillion times the day before). We left camp site at 5:10am, drove to the middle school where we took the shuttle bus to the transition area. Transition area was very well marked. View on the Chesapeake Bay. 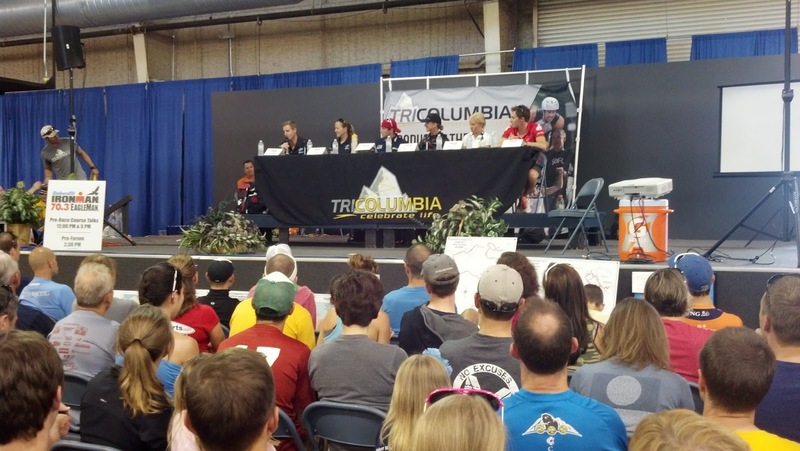 Do you see Andy Potts in the photo above? He won 1st place overall. Super nice guy - I saw him the day before at the expo. 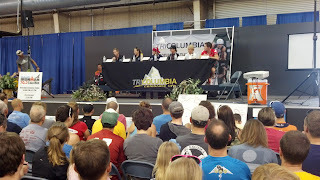 At the podium you also see Greg and Laura Benett, Mirinda Carfrae (she cramped and DNFed), Meredith Kessler (she crashed and DNFed) and few other folks. The night before the race we were required to setup bikes, but the rest of the transition stuff would be setup early morning. At 6:30am they finished body markings and at 6:45am the first wave of pros started the race. My start was 7:30am. The hardest part is waiting for the start. Need to learn to control emotions. The second hardest part is waiting in these long lines for the toilet use. I went another two times right before the race, but the good thing - did not have to use toilet during the race itself (yay!!). For breakfast I had orange, peanut butter sandwich, few almonds, water, few pieces of honeydew. Had one GU gel 15 min before the race start, was sipping water and Gatorade for 2 hours before the race start. On the bike I ate one almond bar 20 min into the bike and then ate total of three GU gels evenly spaced. Total fluid intake was about 30 to 36 oz of Gatorade Perform. On the run I drank water, Gatorade and Coke every one to two miles. Total fluid intake on the run was about 30oz. No stomach issues, but I got tired of Gatorade taste. I think overall nutrition worked well and I am not sure if anything needs to change - perhaps carry my own drinks on the bike and find something better than Gatorade?